fuel for thought: The Driver's Seat Twitter Campaign: Nicole A. As mentioned, Westporters are taking turns in The Driver's Seat of our Twitter account (@WestportDotCom). To date we've heard from Nick S, Caroline S, John L & John H, Astrid Z, Lance F, Monica F, and Fabio V. Our next contributor is Nicole, based in Vancouver. Read on to learn a little more about her. 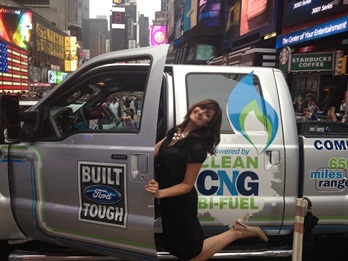 As director of communications for Westport, Nicole finds herself all sorts of places talking to various Westport stakeholders – even driving the Westport WiNG-equipped bi-fuel Ford F-250 pickup on a road trip from Detroit to NYC using CNG only. Nicole enjoys the openness to all types of innovation at Westport, and that trying new things, introducing new ideas and taking risks are encouraged. When she is not speaking with the media at events such as the Kentucky facility opening or planning communications strategies, Nicole enjoys trying new restaurants (pizza is a favourite! ), spending time with her family, and eating popcorn covered in truffle butter and parmesan cheese while watching The Amazing Race. An avid traveller, Nicole has been many places. One of her favourites is Italy. Her goal is to visit 50 countries by the time she’s 50. “I’ve got about 12 to go. Top of my list right now are Croatia and Cambodia.” Worlds apart, those two are, but Nicole will surely make both trips reality before long.